Get moving with fun, boxing-based rhythmic exercises set to the instrumental beats of songs by popular artists. You can personalize your workouts by selecting from different fitness goals. Train your way, whether you’re on your own, with a friend, at home or on the go. Now you can work out anytime, anywhere on the Nintendo Switch system! Surf, Ascend, Escape! Surf through a pulsating underworld on platforms YOU pull from thin air, where and when you want, in this psychedelic action platformer. Unlock devastating abilities across 50+ hand crafted levels as you defy gravity to a pumping beat. The King of Fighters 2002, is a fighting game released by SNK in 2002. The 9th entry in the KOF series. In this tame, the “Striker System” is replaced by creating teams for the comeback of the “3-on-3 Battle Mode”. The easier to use MAX Activation System adds a more in-depth experience to your gameplay! Complete video jigsaw puzzles alone or team up with friends and finish them together! Animated Jigsaws: Wild Animals contains short videos as jigsaw puzzles that are pieced together to reveal stunning shots of wild animals close up! The video puzzles capture 12 animals in their natural habitats, such as Lions, Elephants, Meerkats, Polar Bears and Penguins in fantastic detail. 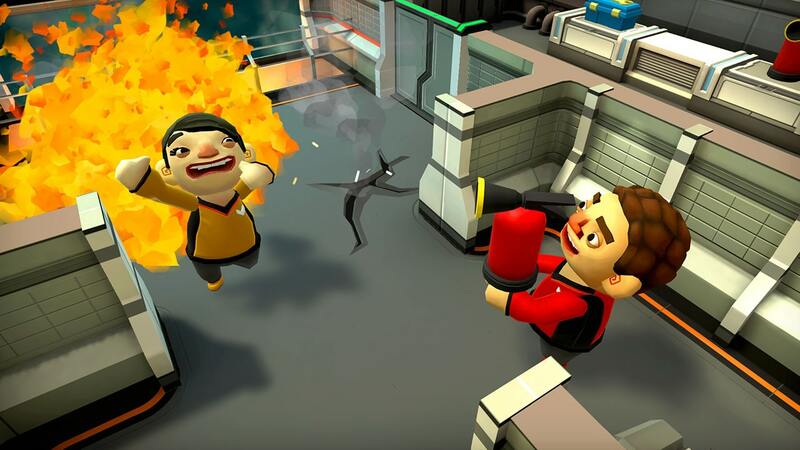 Gather your friends and join the illustrious Space Fleet in this fast-paced party game. Can you deal with unrelenting disaster and hold your ship together long enough to destroy the enemy invaders? Repair systems, extinguish fires, arm the torpedoes, avoid deadly solar flares, destroy your friends and clone them back again – it’s all in the life of a Catastronaut. Explore a massive world with unique islands and landscapes. Discuss rumors and discover the origins of each island by talking to the people that live there. Expect the unexpected when at sea. Events you may be unprepared for may occur such as a foodborne illness among your crew. You’ll need to have access to the right supplies and have the experience to keep your ship afloat. Help Job the Leprechaun to rescue his friend Eri in this classic platformer game. Collect all clovers in the stage and find the door to go to the next level. A horde of goblins, zombies, caterpillars and many more monsters will try to stop you, use your Magic Hat to fight them. This is the age of steam. This is the time of unprecedented technology development never seen before. This is the era of science, research, and inventions. However, this world has also another side, the side not everyone aware of. This world is full of mad scientists who plan to use modern technology for the evil purpose – they want to take over the world. But when evil and deception grow in strength, he will appear. He is the secret agent of an elite unit which has to make sure that the newest science inventions do not fall into the wrong hands. Puzzle game featuring the popular Mentori characters. Use the Hiyoko Ball anytime to easily make combos. Easy to pick up for newcomers to the genre. Progress the Story to collect Photos and have fun with Mentori 4-Box Manga. Alone in the forest, a Unicorn wakes, Searching for its herd as a new dawn breaks. Where are my friends? Not to the west, to find them I must set out on a quest! Aimed at a younger audience this endless runner, virtual pet hybrid is simple to play but hard to put down. With a sprinkle of magical minigames, this enchanted title will be sure to keep you smiling!